Do not miss the latest release of Imec! Imec has developed an organ-on-chip platform that combines imec’s high-density multi-electrode array (MEA)-chip with a microfluidic device. This new technology will allow the culture of cells in conditions that mimic human physiology as well as accurate cell reprogramming to grow complex tissue models. Another great advantage is that it is capable of performing multiple tests at the same time, consolidating itself as a powerful potential tool for cell interfacing applications. 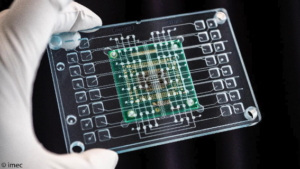 Growing organs on chip, personalized drug screening for disease modelling as well as for patient-derived cell-based therapies are some of the realities that will come hand in hand with this novel technology.